The Zero DAC comes from one of those Chinese companies that few people outside of its home city will ever hear of. This doesn’t make it a bad product because heaps of highly respected AV gear from big name companies is manufactured in equally obscure factories, they just happen to stick a fancy logo on the front. For all I know, the same factory that makes the Zero builds well-known TVs or churns out valves for high-end amps. If they don’t, their neighbor probably does. The Zero is a fully featured piece of kit, especially at the $500 price point. It offers USB, coaxial and optical digital inputs, 24bit/192Khz upsampling, and a 6.35mm headphone jack with a dedicated headphone stage, as well as preamplifier functionality. Build quality isn’t the best under the sun, but at the price point, it’s tolerable. The top, rear and bottom panels are thin and could stand to be a bit more solid because they ring like bells when knocked. However, the front panel is thicker and is festooned with the kind of interesting symbols and typography that could have come straight from a bottle of exotic Oriental liniment. Unlike most inexpensive DACs, the Zero has an IEC socket round back, feeding a proper internal power supply; there’s not a wall wart to be seen. The large bolt on the bottom of the unit and its overall weight inform about what’s inside; this box isn’t filled with warm air. I’m not usually given to popping the top off review products, but curiosity got the best of me and a minute with a screwdriver had the lid off and the insides on display. There’s a rather substantial toroidal transformer (for a budget DAC at any rate) along with four PCBs. This obviously isn’t put together by a team of Swedish engineers but it’s neatly done nonetheless. I had briefly heard the Zero back to back with a $15K Marantz sa-7s1 SACD player in an ATC amp/speaker system and sonically, it was too close for comfort. So out of sheer perversity, I dropped the Zero on the end of $11,000 worth of Qsonix Q205 digital music server, Wadia digital board and all. 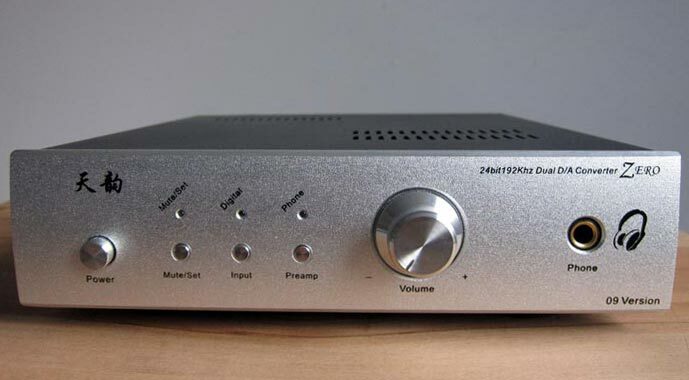 I’d listened to the Q205 using Simaudio’s highly regarded Moon 300D DAC, which sells for $3200. Did the Zero disgrace itself and go running for cover? No Sir, it did not! The Moon is definitely a smoother sounding unit with a more balanced character, but the Zero did an excellent job of turning all the ones and zeros into enjoyable music. I left it hooked up to the Q205 for quite a while and never felt at all shortchanged. Getting to the review proper, I ran the Zero with my Marantz SA8260 SACD as a transport using co-ax and from my MacBook Pro via the USB cable. Getting stuck into a new favourite, a 192kbps rip of Abdulla Ibrahim’s African Dawn, I cued up the superb ‘Blues For A Hip King’ and immediately wondered what the heck was going on. The piano notes were just about hyper-detailed. The resonances and decay after each strike were as plainly delineated as the nose in front of my face and the speed of what I was hearing just about blew my socks off. Quite something for an inexpensive DAC running a low bitrate file straight over USB. A 320kbps rip of ‘The Golden Age’ from Beck’s masterpiece Sea Change had the same effect on my footwear. Was I listening to an astonishing $500 DAC or was this part of the conspiracy to make me doubt my sanity? You know the one, where they tell you it’s a budget piece of gear and then surreptitiously replace the innards with some mega buck components. Either way, I loved what I was hearing. The drums had a palpable weight and real force behind them and the track just soared into the room as if it was driven by a high-end source. Running tracks from disc one of Van Morrison’s The Philosopher’s Stone and switching the source between co-ax, USB (lossless) or direct from the analogue outputs of the SACD player proved frustrating. The performances were close, too damn close. Direct from the Marantz was slightly smoother, with a fraction more oomph, while the Zero had a tad more detail (from the USB in particular, strangely enough) but it also had a touch of mid upper hardness. The differences were tiny indeed, and I had to really pay attention to pick them up, which is not the way normal people listen to music. When you have to strain your brain to hear minuscule variations on a theme, then you know you either need to get out more or just relax and enjoy the songs. I opted for the second choice of course. Everything I played through the Zero had the same transparent and revealing nature, with drive and energy to spare. I found that the dynamics and pace from the Zero were something that could not be ignored. Maybe it’s the power supply or the op amps but something in there is pumping current to the right place, and it’s noticeable. The USB output from the Zero flatters low bitrate tracks to an extent, but you really want to feed it a diet of 320kbps minimum to get the best from it. The headphone output was no match for my Perreaux SXH2 headphone amp but then again, the Perreaux costs something like three times the price of the Zero and all it does is send a signal to a set of ‘phones. Still, the Zero had no trouble driving my Sennheiser HD650s to high volume levels, but what was missing was the control of the Perreaux. Through the Zero, they felt loose, with middling speed and bass that wasn’t as tight or as weighty as it could be. For a $499 combination DAC unit, it’s hard to fault the Zero though, and with less demanding phones, as part of a desktop system, its headphone output would probably be entirely acceptable. Not a lot. If I was going to be really picky, I could point a finger at the lightweight case but then I’d have to point a few more fingers at the price vs. performance vs. versatility ratio and then I’d look silly. The headphone stage is no match for a dedicated head-amp, but that would be asking a great deal. The Zero DAC is a conundrum. Its reasonable price and humble looks mean that many won’t consider it as a realistic option in a good audio system. On the other hand, its abilities make it something that should probably be auditioned, because a surprise may just be in store. It’s certainly one of the best DACs I’ve heard at this price point. As a USB DAC, it’s excellent and that would be enough to justify the price, but remember that it still has two other inputs ready and waiting for a CD or DVD player or even a games console. Glad you like the Zero DAC Ashley, we think it is pretty amazing value too. It is worth mentioning that we sell the Zero DAC in NZ with the upgraded higher specification OPA627 op-amps which helps achieve the revealing yet musical sound quality of this DAC. Available in either silver or black finish. Hi, not sure where you get the $500 price point these can be had for about $220 NZD shipped (with the OPA627 op-amps). Also I have read there have been a lot of reliability issues. Sorry for this comment but I feel it’s in the best interest of people looking to buy this. ^^ Has a lot of info. Thanks for the feedback Joe although you I think you need to look at the whole picture when it comes to pricing. As a NZ supplier we were offering a local warranty along with locally held stock and support. It is worth doing some further research about the shipping costs hassles and delays involved if your imported goods are faulty and have to be returned. All pieces of kit have problems but we cover any problems in the local margin we charge and of course there is also GST to add to the total. In the forum you mentioned you will also find many very happy Zero DAC owners who are blown away by the sound quality at the price point. It sounds like your concern about reliability would be true regardless of the price you could buy at. We have had a very good experience with the ZERO DAC and have been using one in our demonstration room for 18 months now without problems. Cheers. Yes , I agree with Andy Milne’s comments about the advantages of buying through official local distributors , for a variety of reasons . 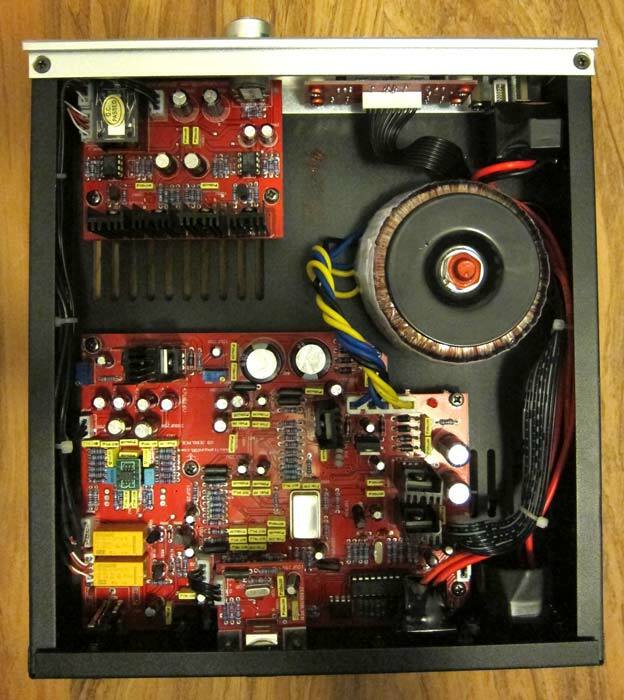 I havw always bought my equipment via local retail shops/distributors , including an ATC SIA2-150 amplifier from TAG NZ , and received excellent service . I know people that have imported products to try to save some money , but when you strike problems you are on your own .